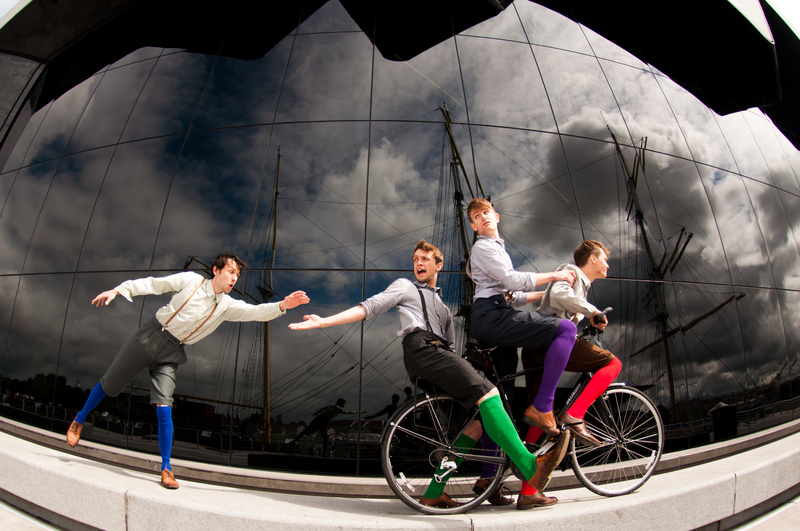 The HandleBards are a madcap, 4-strong, all-male troupe of players who travel by bike to perform Shakespeare. After their hugely successful inaugural tour in 2013, they are back on their bikes and cycling the UK in June, July and August 2014, before setting out across Europe. On just four bicycles they will carry all the necessary set, props, costumes and camping equipment to perform two of Shakespeare’s greatest plays – ‘Macbeth’ and ‘The Comedy Of Errors’. The HandleBards is Shakespeare done differently – using bikes to power various surprises and contraptions on-stage, whilst playing ALL the parts in Director James Farrell’s wild 1930s indie-folk romp. This entry was posted in Community Centre, Events by southscarlecc. Bookmark the permalink.